Amazon (NASDAQ:AMZN) has had a solid year thus far, with revenue growth of over 25% on an annual basis. This is not an easy feat for a company that reported $136 billion in revenues last year. In recent years, Amazon has invested massively in its international segments in order to help future revenue growth and profitability. Within the international segment, it is imperative for e-commerce companies to gain a strong foothold in untapped markets that are expected to grow at a rapid pace. One such battleground for Amazon and rival Alibaba (NYSE:BABA) is India, where both companies are looking to establish their presence. Below we take a look at Amazon’s international segment and why India is a crucial for its growth. 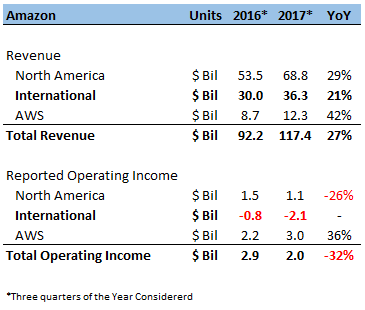 Amazon International is the only segment to operate at a loss in the last three years. It is evident that Amazon is banking on future growth in this segment by investing significantly to acquire customers. In order to gain and retain customers, Amazon has had to spend towards fulfillment expenses, marketing expenses and promotion costs, which are higher than expenses in markets where the company already has a strong presence. 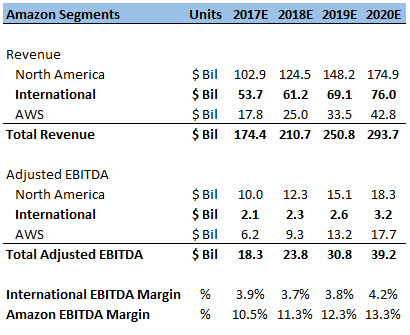 Since the company’s AWS segment has consistently reported high margins and profitability, Amazon has effectively reinvested gains to expand further (read: How AWS Is Funding Amazon’s E-Commerce Expansion In International Markets). The trend has continued this year, with the combined operating expenses for the international segment standing at $38.4 billion for revenues of $36.3 billion. The trend is expected to continue over the next few years as Amazon continues its global expansion plans. China, India and Southeast Asia are valuable markets for e-commerce companies, since they have large populations with relatively lower internet and smartphone penetration compared to many developed markets. Moreover, per capita income and expenditures in many developing countries are expected to continue to increase in the future. This gives e-commerce companies a market with an already large middle class that is expected to grow further. While the U.S. e-commerce market stood at just under $400 billion in 2016, China hit the $1 trillion mark in 2016. 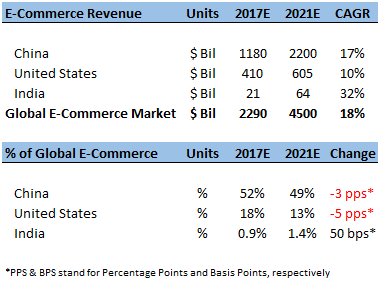 Despite being the largest e-commerce market, China is still fairly untapped given that the penetration of smartphones and high-speed internet is still not at the levels of the U.S, western Europe, Japan or South Korea. As a result, its market size is expected to grow to around $2 trillion by 2019. However, China is not a very conducive market for foreign companies due to the nature of regulations. As a result, China e-commerce is expected to continue to be dominated by domestic players such as Alibaba and JD.com. Amazon’s ambitions in Asia have been further dented after Alibaba announced that it acquired a stake in Singapore-based e-commerce company Lazada last year. Lazada has a robust presence in markets such as Indonesia, Malaysia, the Philippines and Thailand. Continued strong performance and the potential for further growth led Alibaba to increase its stake in Lazada this year. This leaves India as an important untapped international market. India’s e-commerce market is relatively small at the moment, standing at around $15 billion in 2016. However, it has been one of the fastest growing e-commerce markets, with high double digit annual growth in recent years, as shown below. From 2014 through 2016, India’s contribution to global e-commerce has inched upwards from 0.3% to 0.8%. The Indian e-commerce market is expected to grow at a CAGR of over 30% through 2020 to become a $64 billion market. And it is likely not going to stop growing anytime soon. According to research by Wordpay, India is expected to become the second largest e-commerce market in the world after China over the next two decades. 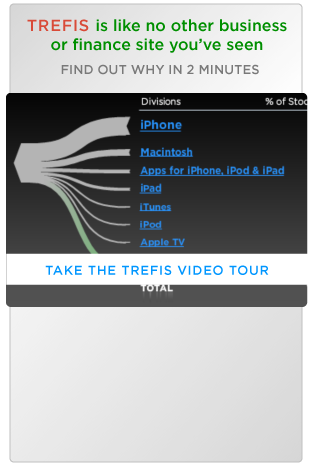 While it has a long way to go in order to reach those heights, that indicates the market’s massive growth potential. 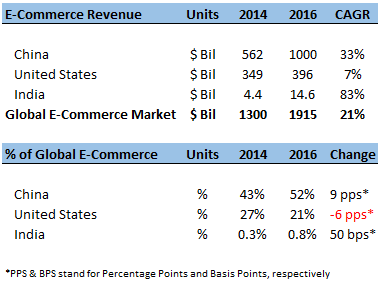 Comparatively, online retail markets in China and the U.S. are expected to grow at a significantly slower pace, as shown below. After Amazon completed the acquisition of Whole Foods, the company signaled its intent to make a further push into the grocery segment in India. The company was in talks with India’s largest online grocery site, Big Basket, about a possible acquisition. While a deal did not materialize, the company’s interest certainly signals its intent to invest heavily in the market. According to consulting firm Technopak, organized retail makes up only 5% of the total $400 billion Indian grocery and food market. Online retailers contribute just $300 million to this market, indicating that there is strong growth potential in the future. With both Amazon and Alibaba looking to solidify their positions in this segment, the market space is likely to be very competitive. 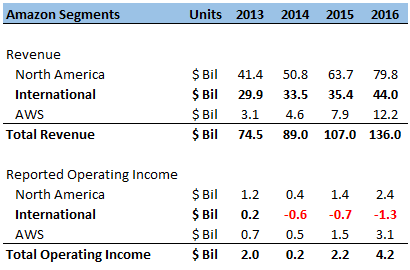 We forecast Amazon’s international segment revenues to increase at a solid clip in the coming years. Our $1,000 price estimate for Amazon’s stock is around 15% lower than the current market price. Amazon’s stock price risen from $750 in January to around $1,190 currently.